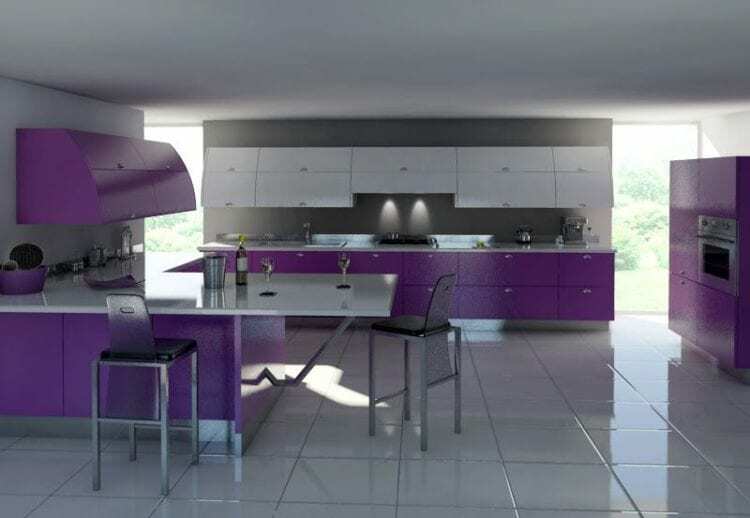 FeastHome – Purple color kitchen is one of the most uncommon color schemes for the room. So, your kitchen would be one of a kind when it’s applied with such color. Purple is a regal color that offers a calm and peaceful atmosphere. It’s a perfect choice of color to be used in a girly room. It can be in the form of fabrics, wallpapers, and accessories added in the kitchen. 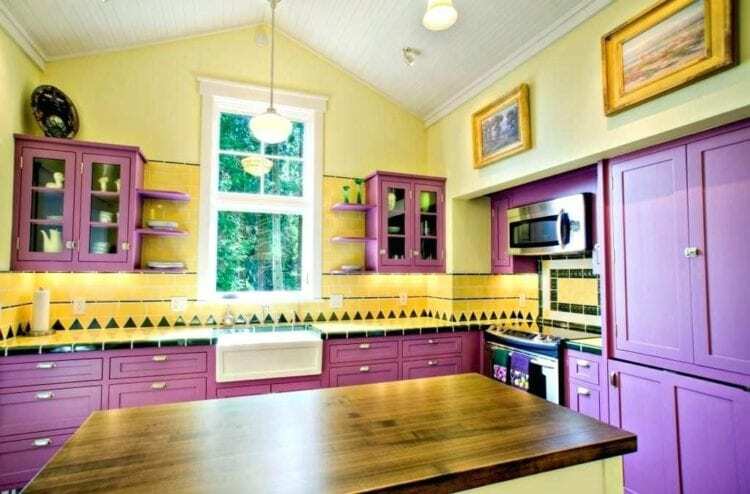 Or, you can even set purple as the main color of your kitchen. In this case, it’s recommended for you to use the softer hues. Purple is also called as violet. 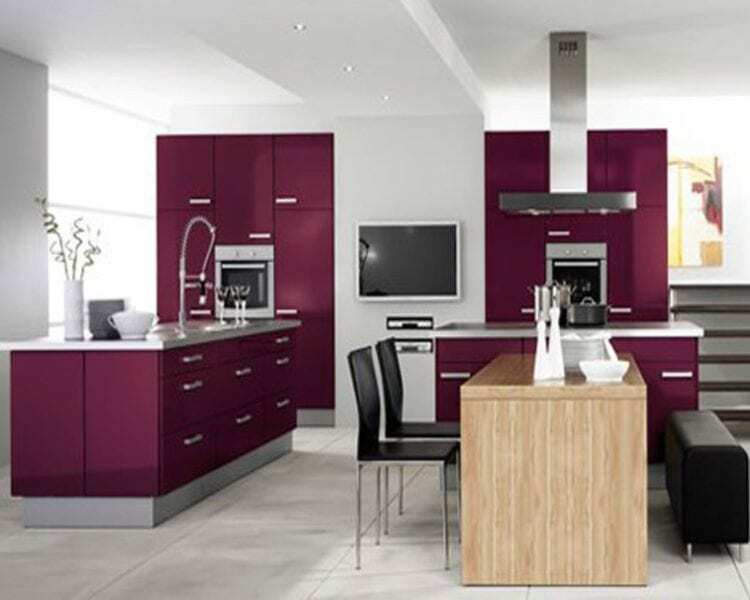 It has various hues that can suit the style of your kitchen. 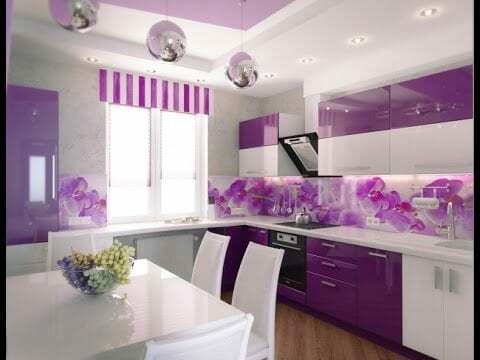 Here, take a look at these purple kitchen ideas. Magenta is one of the purple hues that look really sweet as candy. It’s really close to the color of pink. Besides, there’s also white, black, and grey color in this kitchen. Those earthy colors would really help to let the purple hues in power. Wisteria is a purple shade that’s lighter than lavender. But, it still has the same soft and calm feeling just like lavender. 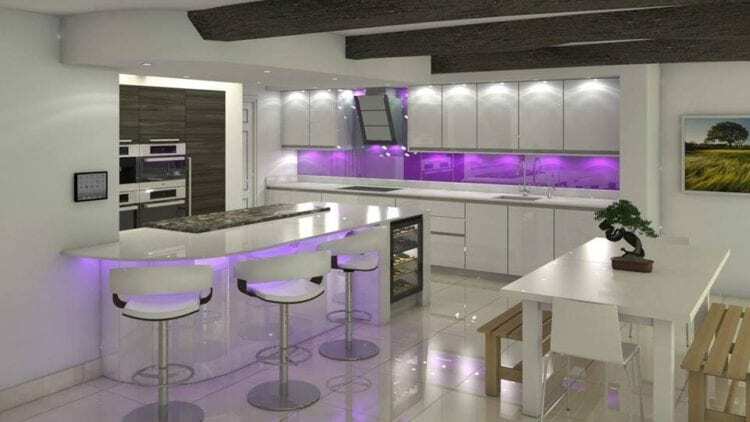 The minimalist and modern style seems to match with the purple and white combination. The only color scheme you see in this kitchen is grey and purple. Both of these colors have their own charm to express. Combining them would create a new feeling to the room. As you can see, all the decors seem to be used perfectly. 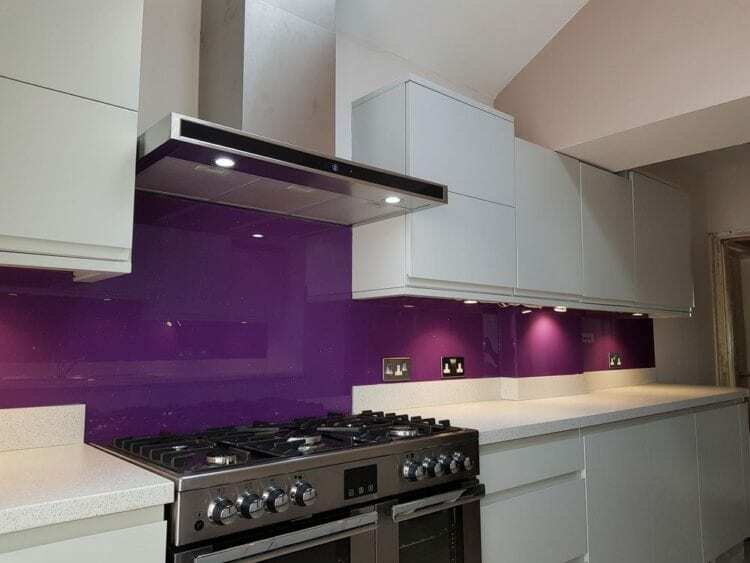 When you choose to have the amount of purple to be minimal, you may need to give it enough emphasis especially in this white kitchen. It’s designed to look like a mini cafe. 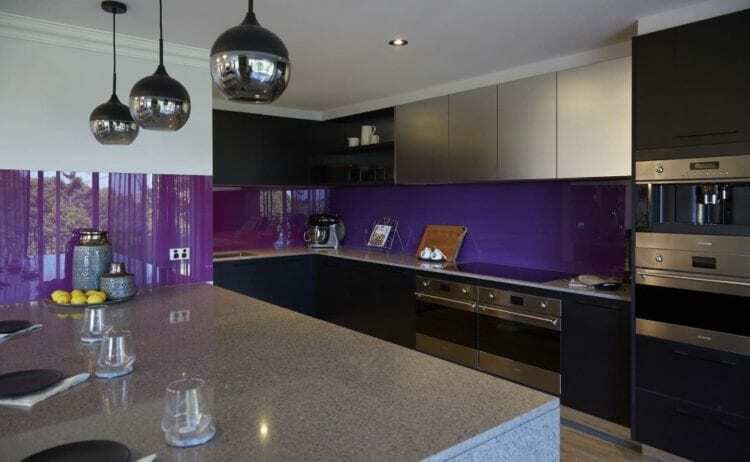 The purple backsplash between the cabinet is supported by the spotlights with matching colors. It’s applied to add a sense of glamour to the room. An underrated color like purple has its own charm that any color doesn’t have. This kitchen has dark cabinets and the rest of the elements are painted white. 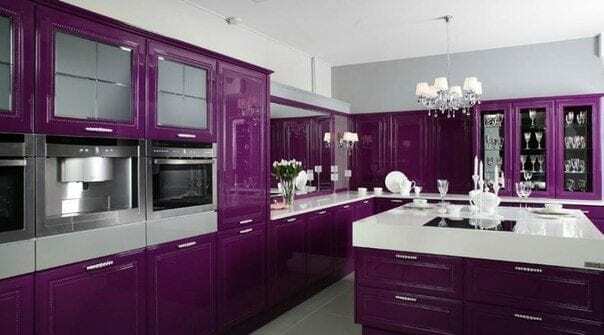 That’s the key to have a magnificent purple kitchen. The designer chose to apply the Byzantium hue of a purple. It’s essential for a room with a purple scheme to have some natural accompaniments. The purple cabinets in this white kitchen are supported by a nice accent from the accessories above the window. The kitchen backsplash has a purple orchid image on it. It incorporates the sense of colorful nature in this kitchen. Combining purple with another dark color could be the biggest mistake you can have for your design scheme. However, if you are creative enough to design the combination, you won’t end up having a big mistake. Just like what you see in this small kitchen. 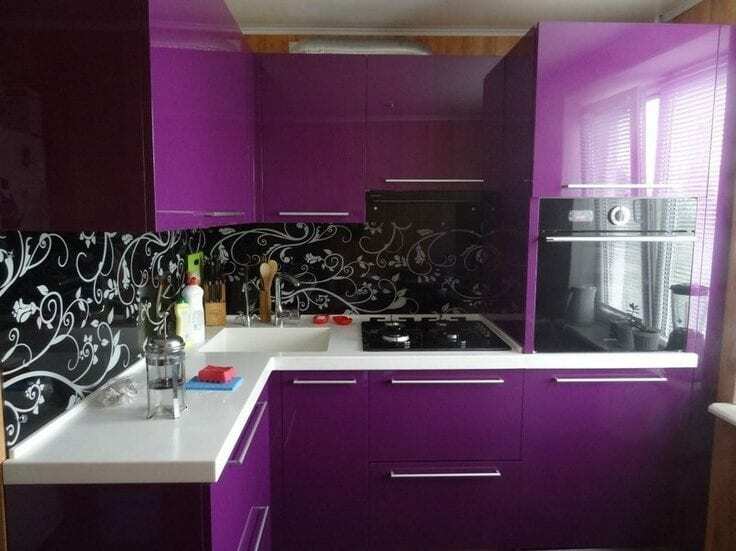 It’s got a black backsplash between the purple kitchens. But, the amount of black is very minimal. It even has a beautiful white floral pattern on it. The white countertop also makes a great balance between the colors. 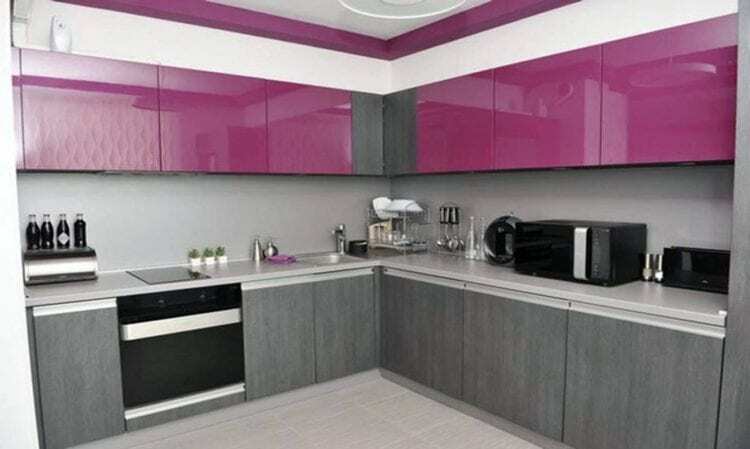 Most of the cabinet parts in this modern kitchen are covered with purple color in a lavender hue. The soft and light sense of the hue spread all over the kitchen space. It would release the soothing and calm feeling of the room. Having a minimum amount of light from the outside seems to be the right decision for this kitchen. It makes the white seems to look gray and it’s suitable for the purple hue. 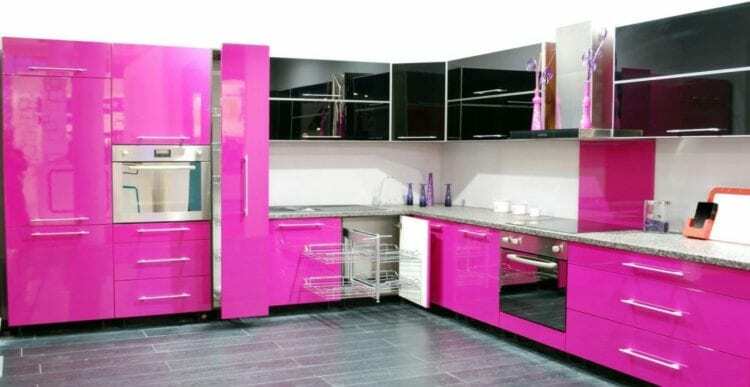 In or to give the shiny look to the kitchen cabinet, plastic is the right material to choose. You will need to provide a good amount of lighting during the day and night. It would create the reflection to add a touch of light to the purple surface. Combining the color of purple with white is the safest choice you can go with. What about yellow? It’s actually very thoughtful. A kitchen needs a color that adds energy to the area. Yellow is pretty popular to use in the kitchen as the energy supporter. 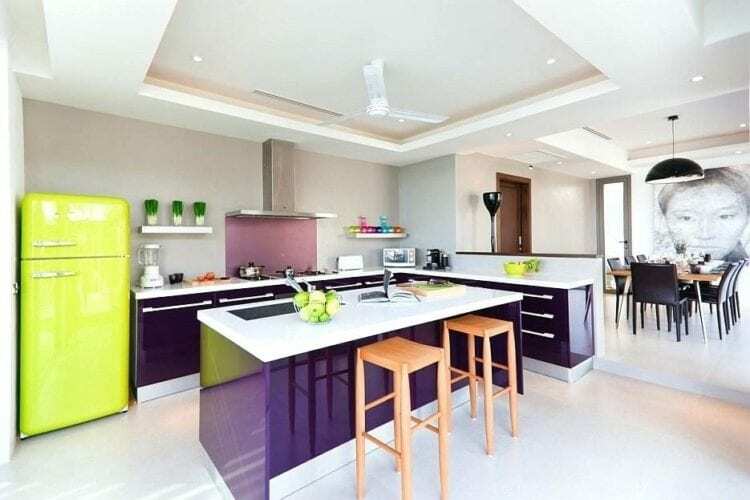 Pairing the yellow with such purple hue can be something great for your kitchen. Unless you should include some neutral color for balance such as white and brown wood. 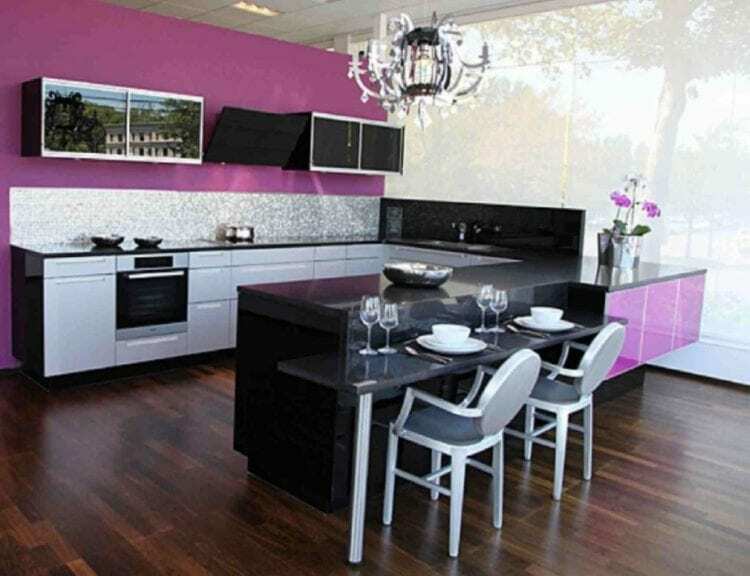 This sleek black and white kitchen are already perfect as it looks, even without the addition of purple color. However, that additional dark purple color element adds more texture and character to this open kitchen. Such artistic backsplash and a vibrant light fixture seem to be in the right place. 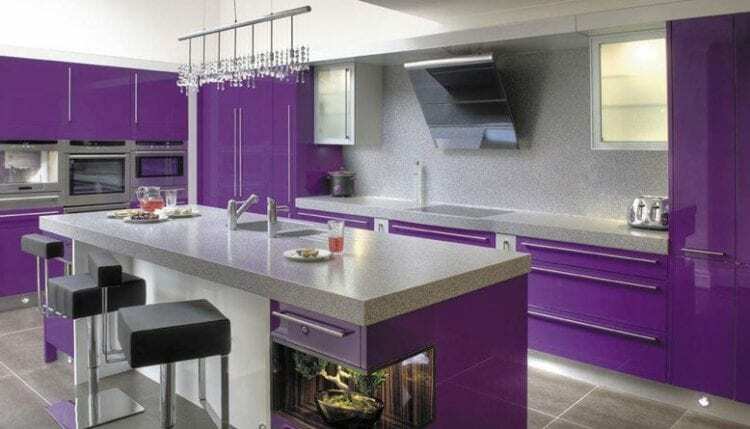 This kitchen backsplash is designed by a Purple Frog company which is well-known for its purple interior products. The reason why most people don’t choose such material for the backsplash because of it’s pricy. But, it’s the best thing you could have for your kitchen. The designer of this open kitchen tried to make the fridge as the source of attraction. It’s quite a success because it has such a unique retro style and bright lime green color. Another grey purple kitchen, this combination is something you should recommend to people who want their kitchen not to look too bright. 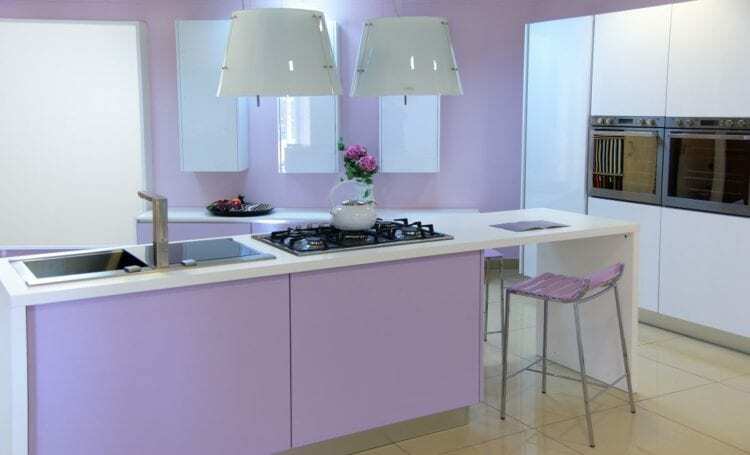 It’s one of the best combinations you can go to design a purple scheme for your kitchen design. There’s a light brown wooden table in the middle to stand out. Pairing black with a bold color like purple is very tricky. You have to be creative to keep the kitchen not being too dark and weak. This kitchen has a good amount of light to settle this. Another dark scheme of a kitchen, it still got bright white elements on the flooring and a little bit on the wall. This is a kitchen from a duo celebrity, Kim and Michelle’s new home. 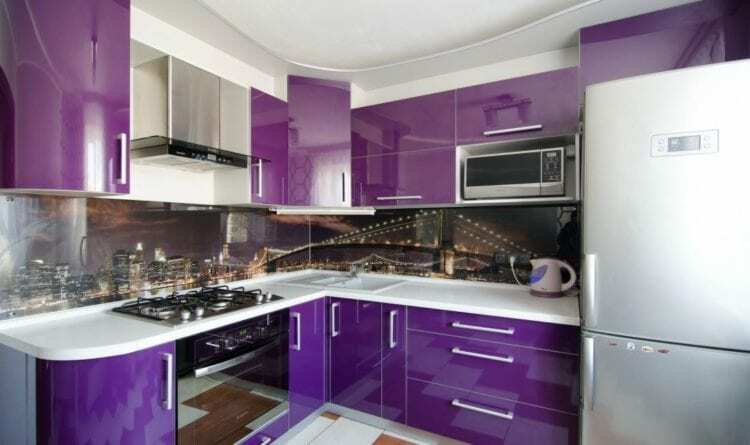 To conclude, the purple color kitchen design scheme is not on the top of the favorite ones’ list. But, it has a special charm that would make your kitchen be one of a kind.